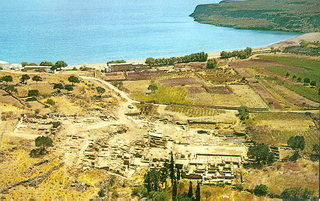 The palace at Zakros is the fourth in terms of size, among the Minoan palaces. It was located at an advantageous strategic position, at a protected bay, and was the centre of commercial exchange with the countries of the East, as is indicated by the excavation finds (elephants' tusks, faience, copper etc.) It has two main building phases: the old palace was built in c. 1900 B.C., and the new one in c. 1600 B.C., but was destroyed in 1450 B.C. along with the other centres of Minoan Crete. The palace was the administrative, religious and commercial centre, and was surrounded by the town. After its destruction, it was not rebuilt and the site was used only for cultivation. Burials have been uncovered inside caves on the slopes of the "Ravine of the Dead", as the ravine that stretches from Epano Zakros to Kato Zakros is called.